Figure 1. Hectospec focal surface. The Hectospec is a multiobject, moderate-dispersion spectrograph that uses a pair of six-axis robots to position 300 optical fiber probes at the f/5 focus of the converted MMT ( see this paper for details ). The converted MMT's f/5 focus uses a refractive corrector designed by Harland Epps to provide a 1° diameter field optimized for fiber-fed spectroscopy. The Hectospec consists of three major parts: (1) the fiber positioning unit that is mounted on the telescope, (2) a large stationary spectrograph mounted on a 1.8x3.7 m Invar-surfaced optical bench and (3) a 26 m-long bundle of optical fibers connecting the fiber positioner and spectrograph. 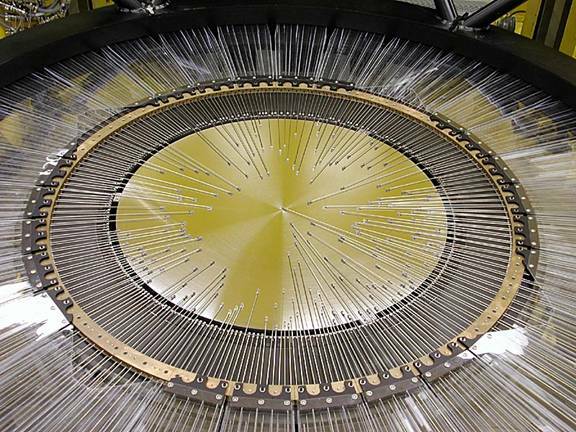 The fiber robots position 300 fibers in 300 s to an accuracy of ~25μm. Each fiber has a core diameter of 250μm, subtending 1.5" on the sky. Adjacent fibers can be spaced as closely as 20", but the positioning constraints are complicated due to the tube extending from the fiber button to the edge of the focal surface. Currently we possess a 270 line mm-1 grating blazed at ~5000Å and a 600 line mm-1 grating blazed at ~6000 Å. The efficiency curves are shown in Figures 15 and 16. The detector array consists of two butted EEV CCDs, each with 2048 (spatial dimension) by 4608 (wavelength dimension) pixels. The gap is parallel to a dispersed spectrum. The CCDs have a readout noise of about 2.7 e-, and are operated at a gain of 1 e-/ADU. With the 270 line mm-1 grating the spectral coverage is 5770Å, with a dispersion of 1.21Å pixel-1. The image FWHM is slightly less than 5 pixels, or ~6Å. 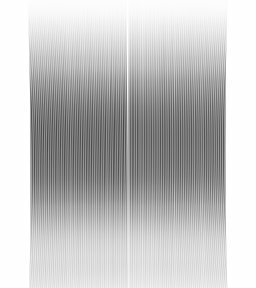 The fibers are mounted in two rows; images of even and odd fibers are separated by ~30 pixels (in the wavelength direction) at the detector. This document is intended for astronomers preparing for observations or attending the instrument at the telescope. The astronomer's duties are limited to preparing the fiber configurations for observing (well beforehand), and taking queued data with the bench spectrograph. MMTO and SAO staff will prepare the spectrograph for observing and will operate the fiber positioner. Perry Berlind or Mike Calkins will normally be present during your observing run (very occasionally another CfA person will substitute) to operate the fiber positioner and to provide advice on operating the spectrograph. The CfA robot operator will fill the dewar once a day. Their decisions on operating the fiber positioner safely are not negotiable, and are based on previous operating experience. The observer's main responsibilities are to prepare the fields for observation with the planning software, to take data with the spectrograph, and to help replan observations during the night if conditions require a change. Observers should be familiar with the planning software and the instrument constraints described in the next few sections. Hectospec is operated in queue mode. 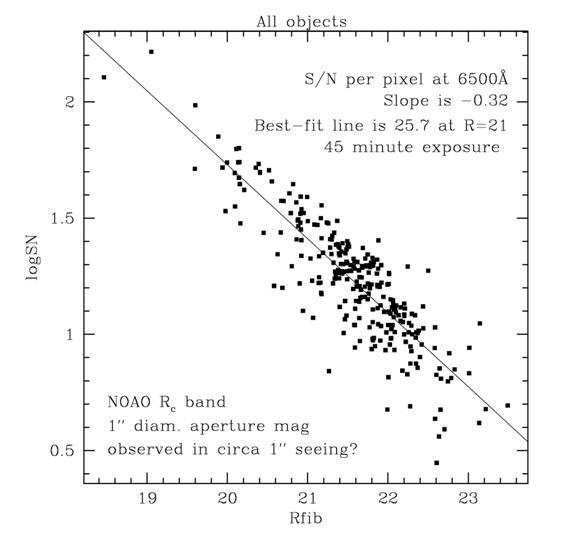 Observers may therefore expect to receive a fraction of the clear observing time during each run equivalent to their fraction of allotted time during that run. We try, if at all possible, to observe some of the officially scheduled observer's fields during their run. If observers are not prepared with valid configuration and catalog files, observations cannot be made. Note that observing requests not completed at the end of the trimester do not roll over into the next observing trimester. Currently Nelson Caldwell is responsible for queue scheduling. Nelson reviews the submitted files to see if they are valid, and makes the nightly schedules. We believe that the queue observing mode for Hectospec and Hectochelle has been a scientific and operational success. The Hecto team and FLWO staff support the operation of the queue in three ways: (1) SAO scientists and engineers have maintained and serviced the instruments as necessary, (2) Nelson Caldwell has scheduled the queue observations, and (3) Perry Berlind and Mike Calkins have operated the robots. The nightly scientific supervision is the responsibility of those with assigned Hectospec and Hectochelle time. During the assigned nights, the astronomer would attend to the following items, which center around insuring that good quality data are obtained. 2. Annotate the data logs (now under automation), with comments on conditions, data quality, problems encountered, etc. 3. Check the operation of the spectrograph/CCD at the beginning of the night, and monitor readout noise, spectrograph focus, thermal flexure, etc. Normally, the actual focusing would be done by the robot operators, Perry and Mike, who would also fill the CCD dewar. 4. Be knowledgeable about the fiber assignment code "xfitfibs", in particular with regard to the restrictions on rotator position and guide star selection, to the extent of being able to run the program at the telescope should the need arise. 5. Be knowledgeable about the normal sequence of operating the positioner and acquiring fields, so that when problems with acquiring a field occur, the robot operators can be advised as to how to proceed (e.g., moving on to another field because of poor guide stars). This would not include actually operating the positioner; that task would remain in the capable hands of trained personnel. 6. Do quick look reductions of data as it appears, checking for overall quality, and in particular insuring that the spectra fulfill program goals. E.g., are objects detected at all (coords ok? ), are objects underexposed or overexposed, etc. 7. Help make decisions regarding the queue during times of marginal weather or seeing, choosing targets from the nightly list. Normally, the nightly observations are scheduled by the queue manager (Caldwell at this time). To aid the on-site astronomers, each group with Hectospec time will be expected to supply a brief summary of their data and calibration requirements. Multifiber instruments require a lot of preparation for successful observations. In general, one should expect to spend several days preparing a catalog and running the fiber configuration program, xfitfibs. The finished catalogs are then submitted to SAO and the MMT via xfitfibs. Here is an outline of the process. (1) The PI makes a catalog of objects, which may be ranked in preference. The catalog must also include guide stars on the same coordinate system. Guiding is done at the edge of the Hectospec field, not on the surface where the object fibers are positioned. 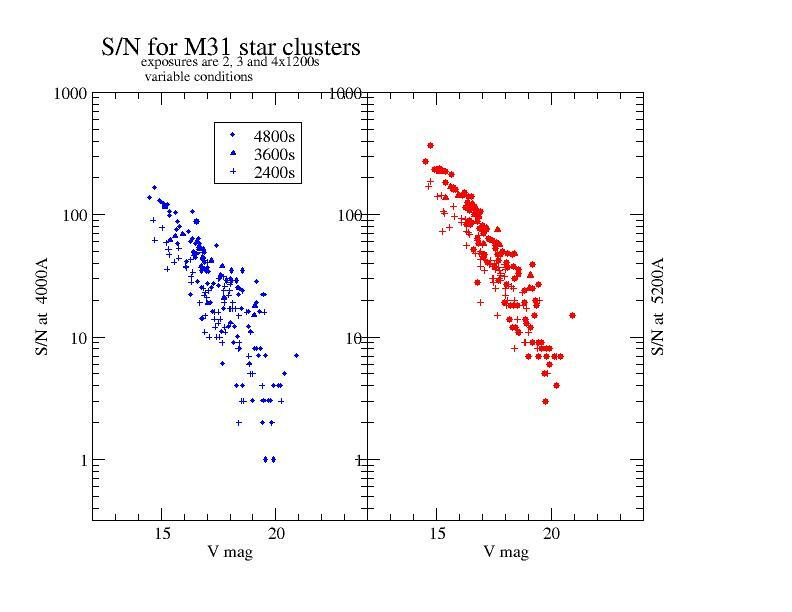 Thus, there are very stringent requirements on guide stars by the small area of sky available and the limited range of magnitudes allowed by the TV cameras (2 mags). 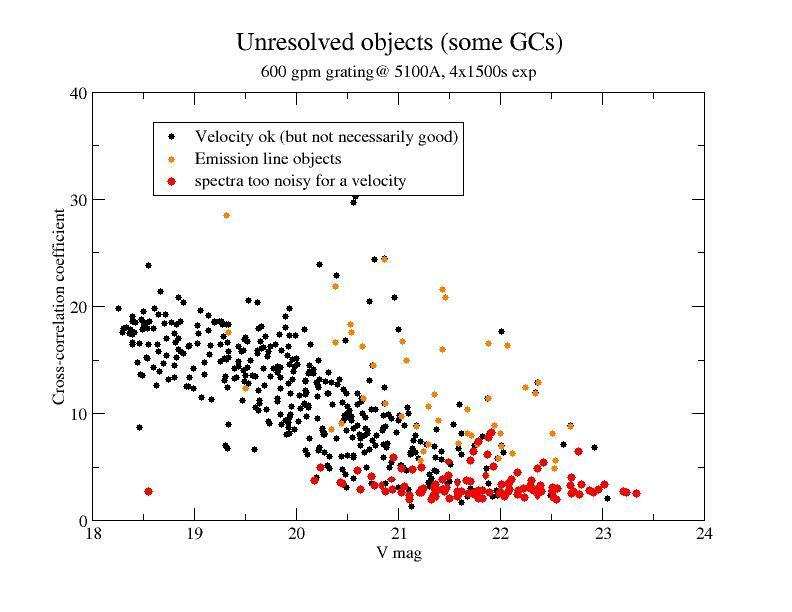 The 2mass and GSC II catalogs can be used where an observer catalog is minimal in stars. In that case, the program tmcguidestars should be used. This program searches the 2mass catalog for coincidences with the observer catalog, and computes a coordinate transformation. 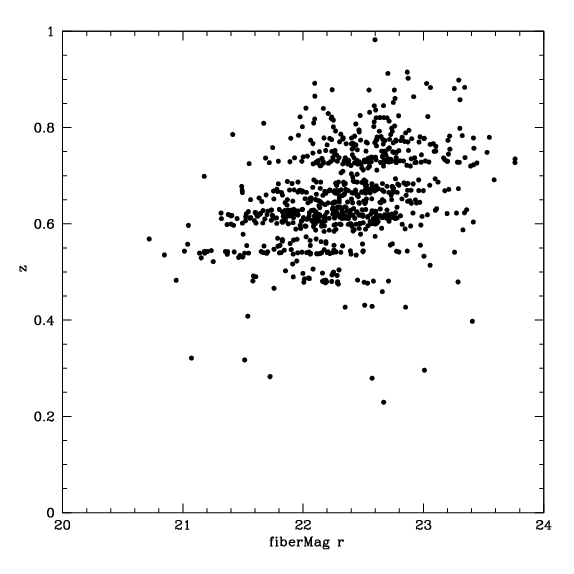 2mass and GSC II stars are selected in the field, transformed to the observers' catalog coordinate system, and added to the catalog. Note: the target catalog must have some stars in common with the 2mass catalogs. You might need to add stars to insure that, even if you don't intend on observing them. tmcguidestars is not exportable It does run on CfA computers, in a command line mode. External projects should contact instrument scientists if they need help with guide star selection. and runs the config program for approximate dates of observation. In this process, guide stars are checked for suitability using a number of criteria (magnitude range, not a galaxy, no neighbors, etc). This program only works on 64bit Linux systems. Users have had success running it on Macs, by using the commercial product "Parallels" and installing Ubuntu on that. (3) xfitfibs requires information such as date and length of observation, number of exposures, ranking of config, grating or filter and binning, all which will be used in scheduling. The output of the program is a number of files which would now be sent to a CfA computer for human checking, via the button Submit . 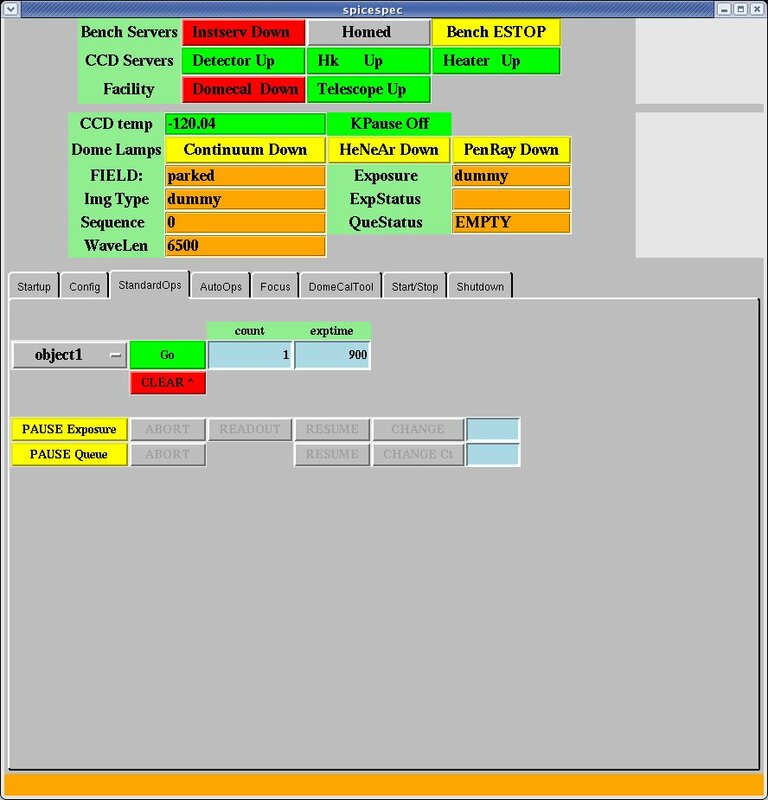 After they are checked at CfA, the configuration files are sent to a computer at the MMT. 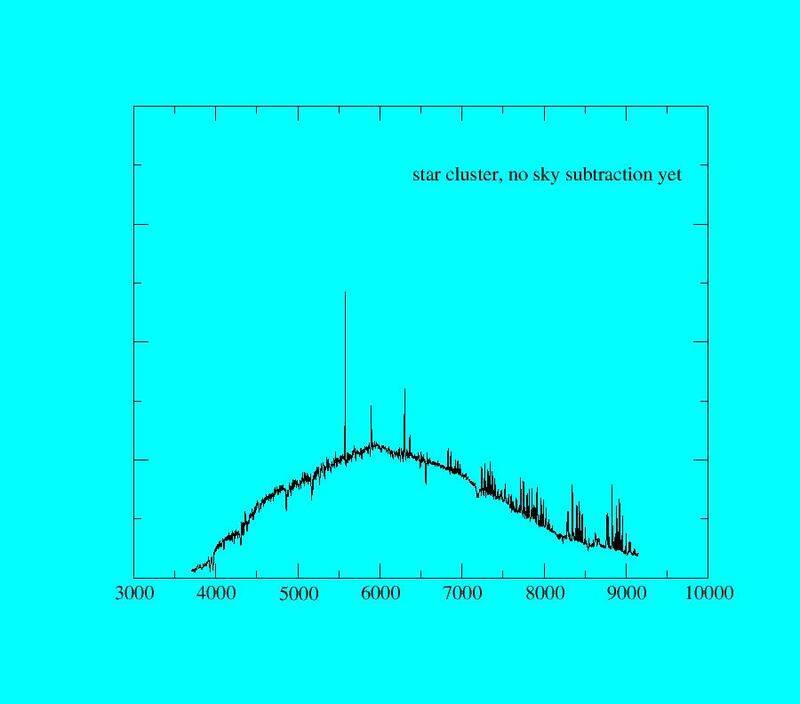 (4) The configuration file is modified at the telescope a few minutes before the observation takes place, in order to update positions, rotation angles, random sky selections, and guide stars. Please submit your configuration files at least 10 days before the run starts. Here, I describe the basics of obtaining a fiber assignment file from a catalog. The xfitfibs program itself contains many pages of help for particular items, and after going through the steps here, one should consult those pages for detailed help. Note the row with dashes (also tab delimited). "guide" indicates the guide stars, located at the end of the file. In this case, the guide stars have no rank or object name (but the tabs are there). A type of "skyobject" may be used for specific assignment of background - these are treated by xfitfibs the same as "target". "Fiducial" is used for objects that help define the coordinate system (e.g., bright stars), but which should not be assigned to fibers. 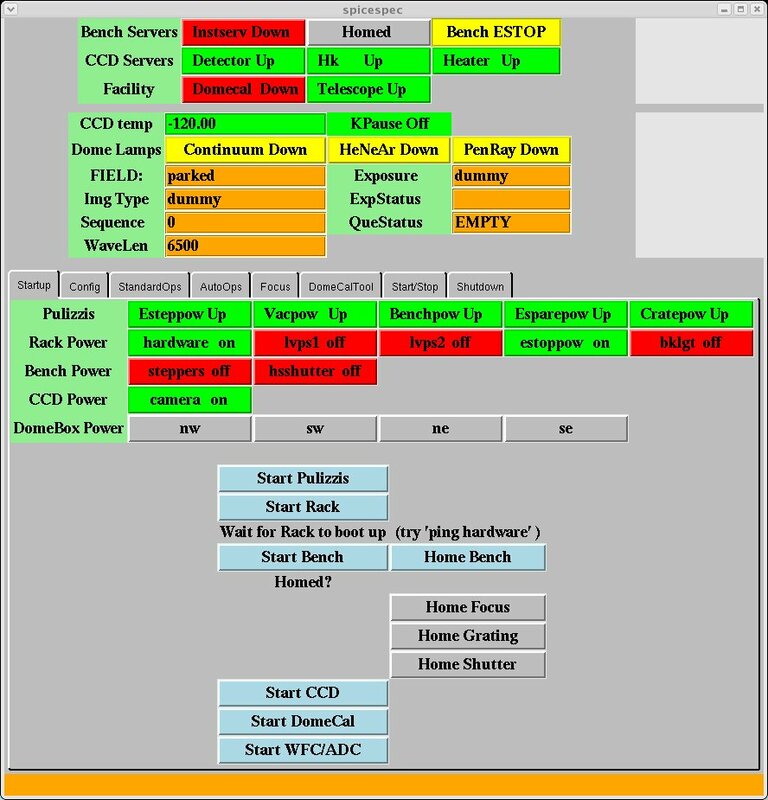 Rank is used by the program to order the target assignments - Lower numbers are assigned first, i.e., rank=1 targets are preferred over rank=2 . Only the integer value is used for ranking. Guide stars should be selected such that the range in mags is about 2. The faintest should not be fainter 16, but for programs which use bright time, the faint limit should be about 15. The command check is useful to run on your catalog to see that the format is valid (type "check -v < mycatalog"; no message means that the catalog is valid). The command fldtotable will convert an ascii table to starbase (see the starbase help pages). 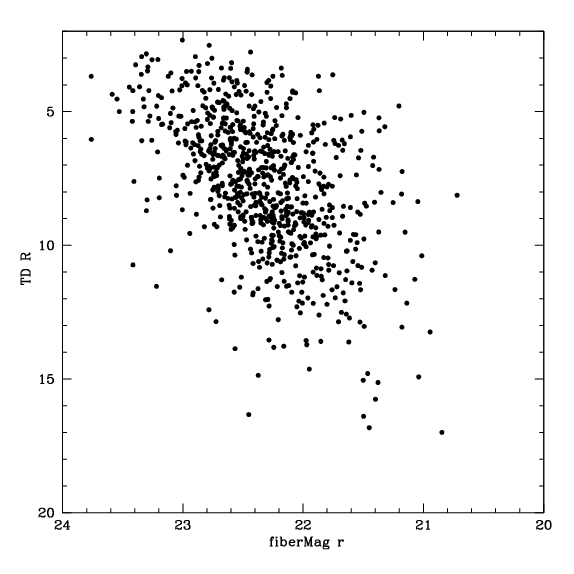 It is nothing short of essential that the targets and guide stars be on the same coordinate system. For nearby stars such as flux-standards, do not forget to include proper motions in your coordinates. Load a file with pull down menu. This will draw the objects and a 1d circle centered on the objects' centroid, and also make 1 target center in the fld window. Enter an exptime in minutes and nexp (e.g., 15 and 3). (Leave pa, minutes, r0, r1 and r2 alone). If needed, enter the number of repeats of those exposure sets (default is 1). Repeats is needed for projects where either a time variation is being studied, or the total exposure time needed is longer than 2-3 hours. If you are using more than one filter with CHelle, you may enter different exptimes and nexp for those, separated by a space. For instance, if filter is "RV31 OB24", entering exptime of "30 40" and nexp 2 3 would request 2x30 min exposures in RV31 and 3x40 minute exposures of OB24. For each entry in the field table enter a rank, which will be used by the program. Targets in the catalog with low rank will be preferred in fields of low rank (lower numbers are selected first). Also enter a priority for each field, which will be used in scheduling (lower number here also means more preference is given). These are global, meaning that if you submit multiple configurations, you may use the priorities to set the order of observing for all of them. If you need sky offsets, please enter the number and time in minutes per exposure. Offsets will typically be 5 arcs; successive exposures will be in different locations with the same offset value. for Spec observations, leave binning blank and filter blank, but select the grating: 270 or 600. Then select the centralwave(length). For the 270, this is always 6500. For the 600gpm grating, you have a choice of 4800, 5300, 5800, 6300, 6800, 7300, 7800. Errors will occur upon submission if you enter invalid numbers. Click somewhere in a row in the field table. The circle with that field center should turn red in the Drawing window, indicating it is being operated on. In the drawing window you may now move the circle to where you want it by clicking and dragging, or enter new coords by hand in the field table. You may add fields by using the table pull down menu. The number of guide stars will appear at the far right of the fld table row. A red background means either too few stars available or the ones you have are not distributed around the circle in a usable way. For the former problem, you may have to move the circle center or change the mag limit on the guide stars (at the peril of them not being seen at the telescope). The second problem arises if you don't have any stars for probe 2, which is the longest length guide annulus in the display (3 is the shortest and 1 is in between). If a rotation of the circle doesn't cure this, then you will also have to move the center of the circle to get more stars. You can change the rotator angle angles by clicking on "toggle guide annuli", going to the drawing window clicking on the (faint) red circle at the ends of any of the 3 annuli and dragging the annuli around until stars are in annuli 2, and (1 or 3). Turn the red radio button for that field off, and fit guides again. To move the center of the cicle, you can either leave the radio button on and have the program move it, or move it yourself by grabbing the blue cicle with the mouse and moving it. After a while a message will come back with the results. Some stars may be rejected. Click on ok to rerun the guide star selection. You can view the guide stars by bringing up the "Guide" window. Use view to elect each config in turn. Clicking on show, will start up ds9 and display all the guide stars in different frames. (Note: you must have ds9 and xpa installed on your computer). Nixed stars may also be seen by using view. If you are left with no guide stars, you may try to lower the faint mag limit in the parameters menu, but please advise us that you have done so, and expect some trouble at the telescope. Click on fit fibers, if your objects have a ranking system, then select rank, otherwise don't click on it. If your catalog has fewer than ~1000 objects, you can make depth=7; for larger catalogs, leave the depth at 5. If you are configuring for Chelle, click on that as well. Now, begin fit. Click on the Send tab. A number of files are then sent to CfA, where they are checked again before being sent out to Mt Hopkins. 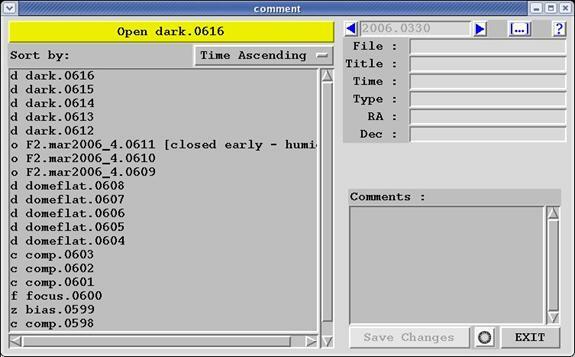 Note that sending a config file (the one actually used at the telescope) directly to Mt Hopkins is discouraged, since such a file would not have the Program number identified, that being added during the "send" process. Send will fail if you did not classify the guide stars. Go back and classify them, and then run Fit fibers again. Send will fail if you did not enter a valid filter or binning for Chelle observations, or valid grating and centralwave(length) for Spec. Correct those, and press Fit fibers again. Now submit. If you change something like the grating or exposure time, you may get a warning about changed parameters in the field table when you submit. You can ignore this if you didn't change anything drastically. Spectrophotometric standards are observed every 2-3 nights, as weather and the schedule permits. The throughput corrections defined by such observations has not changed in several years (an advantage of a fiber spectrograph), and thus we do not observe standards every night. 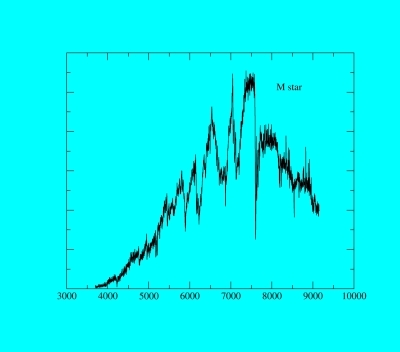 Radial velocity or line index standard stars may be observed as part of a program by making a configuration file as above, with one target, and submitting it as usual. Time spent on spectrophotometric and other standards observed in the single star mode are not charged to programs, as long as the requests are reasonable. All observed standards are made available to all programs, usually at the end of the trimester. The Hectospec bench spectrograph has 3 motors that need to be powered up and initialized at the beginning of a run, and often at the beginning of each night as well, if power has been shut off for safety. These motors control the CCD dewar focus stage, the grating angle, and the High Speed Shutter (mounted on the fiber shoe). The CCD electronics control and the dome calibration lamps must also be powered up and initialized. Login to lewis as spec or chelle as the case may be. A window called spicespec or spicechelle should appear, as well as the comment editor and ds9. Figure 8. Spice Startup page. Use this to initialize software and home the three spectrograph motors. After this process is complete, return to the startup page for observing. There are several tabs in this menu, which can be selected as needed. For the first start of a new observing run, select "Startup,"" which is used to initialize the spectrograph. The sequence is: Start Pulizzis, Start Rack (wait 2 minutes) Start Bench, Home Bench, Start CCD, Start DomeCal. The CCD temperature is controlled via a heater in the CCD dewar. If the CCD electronics have been off for a while, say since the previous morning, the temperature will be colder than nominal (perhaps as low as -135 C) and thus the heater will come on for an extended period till the temperature reaches -120 C. Thus, for critical measurements, you may wish to monitor this temperature until it reaches nominal, as shown on the Spice upper panel. The next tab allows configuration of the bench, e.g., changing the grating or grating tilt. Press "ConfigBench" at the begining of the Hectospec run, or if you have changed either the grating or operating wavelength. Also on this page, enter the observers' name. The Program ID ("Propid") and the PI values will be entered automatically when a configuration is selected by the robot operator. For testing purposes, the telname may be set to "Test", the instrname may be set to "test", or the detname may be set to "test" or "specn". Nomally, these should be set to "mmt_f5_adc", "hectospec" (or "hectochelle"), and "specs". If the telescope is off however, and you want to take some test data (darks for instance), then set the telname to "test", lest an error occur. The grating, binning and/or the wavelength setting is chosen in this tab as well, with only the allowed choices being available in the pull down menu. The configuration loaded by the positioner software limits the choices for these parameters, thus minimizing the possibility of mistakes. 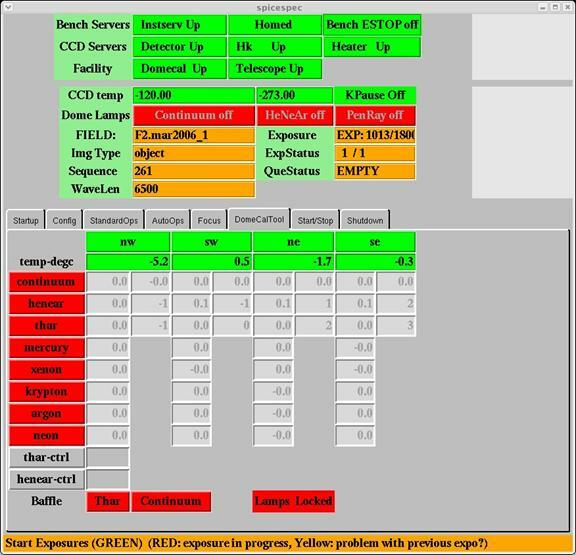 The"Standard Ops" page provides exposure control for the CCD, as well as limited control of the spectrograph and the dome lamps. The control is based on the ICE system. Figure 9. Spice Standard Ops page for taking spectra. If the box on the lower left above the Pause button is selected, a pull down menu of observation types appears to select the exposure type. An exposure is taken by selecting a type of exposure from the pull-down menu (shown as object1 here). Choices include "object", "comp" etc. The number of exposures and the exposure time are taken from the columns to the right Go box (green before an exposure, red during an exposure as shown here). Click on Go to start an exposure. A title may be entered, but normally the title is already filled in. The Exposure box and queue status shows the progress. Upon readout completion, a beep is issued and the file is automatically displayed into a ds9 window (called "ds9spec"). To stop an exposure, first pause it. File names will have the naming convention of TYPE.nnnn.fits, where TYPE is the fiber configuration name for OBJECT exposures (see above) or the type of exposure for all others, and nnnn is a running count number among all types of frames. The files are stored in directories created automatically for each night, with the form: SPEC/year.monthday. E.G., SPEC/2004.0409 (If Hectochelle is in use, CHELLE replaces SPEC. The rest of the tabs are described below. Under normal operation, SPICE knows what field has been loaded into the fiber positioner, and what kinds of exposures have been requested for that field. Thus, the title, grating setting, the exposure time, and the number of exposures will already be loaded into SPICE, and most of the time all you have to do is click on "GO". The exception occurs if the grating needs to be changed or its angle needs to be changed. 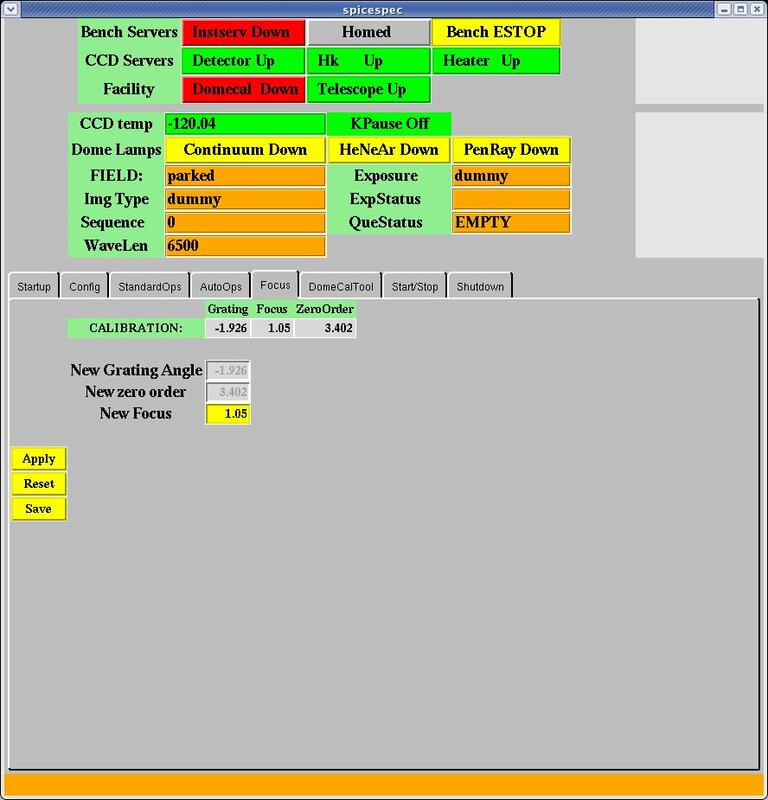 The robot operator will do the grating change in the spectrograph room, then you need to go to the Config tab and press "ConfigBench". If a grating tilt change is needed (done only for the 600gpm grating), you would also need to "ConfigBench" before taking the next exposure. OBJECT: opens the shutter, writes"object" as imagetype in the header. SKYOBJECT: opens the shutter, writes "skyobject" as imagetype in the header. Used for blank sky fields taken between object fields. SKYFLAT: opens the shutter, writes "skyflat" as imagetype in the header. Use this for twilight sky exposures. COMP: opens the shutter, writes "comp" as imagetype in the header. Use this for dome exposures of HeNeAr etc. Startup the dome lights with the appropriate button for HeNeAr, exposure times of about 5x300 seconds are recommended, multiple exposures are useful to eliminate cosmic rays. With the PenRay HgNeAr combination, shorter exposure times may be used (30 seconds or so). DOMEFLAT: opens the shutter, writes "domeflat" as imagetype in the header. Turn on the dome continuum lamps. For the dome continuum exposures with hectospec, an exposure time of 2 seconds is recommended. Shorter exposures may suffer from shutter vignetting, and thus would not be useful for throughput corrections, though the files should still be ok for pixel-pixel flattening. QFOCUS: used for SPEC only. Enter the number of exposures desired, the center focus value, and the focus step between exposures. Good values for SPEC are 7, 4, and -0.04. This routine will take a sequence of exposures, at the requested sequence of focus values for the spectrograph, which can then be analyzed. Typically, one uses the dome calibration PenRay lamps for this purpose, though night sky emission lines work well also. The exposure can also be done while the mirror is covered. This program uses the grating in zero order, and the charge is moved between the exposures, thus only one file is produced. The image will have one spot per fiber, per exposure. So the image will have 300 rows of n spots, where n is the number of exposures. 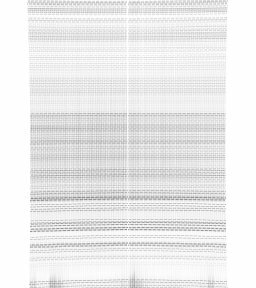 Bearing in mind that the in-focus images are not Gaussian but rather flat-topped, a script has been written that analyzes the data frame and produces a plot. In an iraf window, type this command: qfocus filename. A plot in gv will be produced showing image concentration as a function of focus position. Different fibers are shown as different symbols. Higher concentrations are better. Once you have determined the focus, you still must set it using the Focus tab. FOCUS: used for CHELLE. Enter the number of exposures desired, the starting focus value, and the focus step between exposures. This routine will take a sequence of frames, at the requested sequence of focus values for the spectrograph. Typically, one uses the dome calibration HeNeAr or ThAr lamps for this purpose, though night sky emission lines work well also. FOR CHELLE : the step should be -0.05, exposures 120s, and take 7 of them The program FOCUS.sh N, will extract information from the most recent N focus exposures To run this, type ./FOCUS.sh in a terminal window (not in iraf). Another program will display the focus files in tiled images on ds9. In this case, type display_focus N.
DARK: does not open the shutter, writes "dark" as imagetype in the header. There are light leaks around the shutter, so darks should be taken with the chamber lights off. The dark rate is extremely low, and in normal circumstances does not need to be measured. Be aware that the fluorescent lights in the spectrograph room will elevate the dark count significantly for about an hour after they are turned off. BIAS: leaves shutter closed, writes "zero" as imagetype in the header. There is some structure to the bias, so we recommend taking a handful of these at the beginning of the night. The autoops tab is not described here. The focus tab is used after determining a new focus. Enter the correct value next to new focus, click on apply and set. The next tab shows the calibration lamp status. The lamps themselves are usually controlled in the standard ops tab, but this tab shows the details of eack kind of lamp. 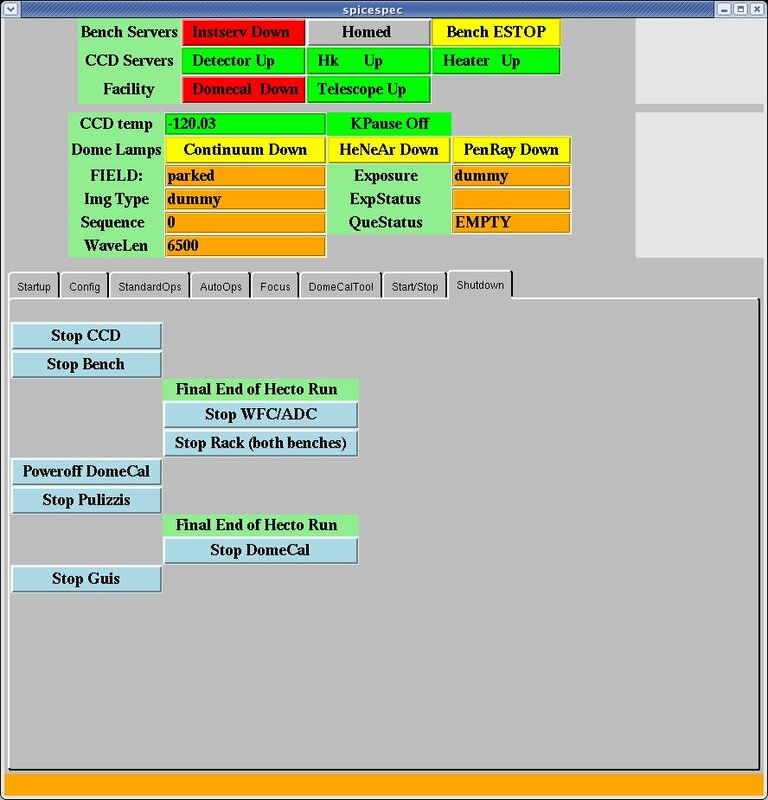 The start/stop tab allows control of the many software servers in the system. Select the action wanted at the middle right ("restart, start, stop"), then click on the button desired to the left (e.g., domecal up). The shutdown page allows one to shut down the spectrograph and wide field corrector. Normally done by the robot operators. The comment window is used to create and maintain the data logs, which are mostly automatic. The one thing the observer can add is a comment when needed. In particular, it useful to comment on the seeing and cloud presence during the night, and any problems with particular files. To do so, first insure that the correct data has been selected (recall that we use the UT date). To comment on an existing file, click on its name in the right panel. The basic information will appear to the right, and you can now type into the comments panel. Click on Save Changes. To edit an ongoing exposure, click on Open Current and then enter comments. To view the data logs, click on the sunburst button at the bottom right. A postscript file is created and the displayed using gv. Exit gv using q. Very lengthy comments will be truncated. Type what you need, display the result, and if necessary, move the excess verbiage to the comments for the next exposure. Copies of these logs may be viewed by non-attendant astronomers at around noon EDT at this web site. Figure 12 Example data log. The A/D converter is 16 bit, so saturation occurs at 65536. There are 2 amplifiers per CCD, and thus the data are stored in FITS extension format, with 5 extensions (0 being the main file header). Among other things, this means that in iraf, you will occasionally have to refer to the file as filename or , say when using imheader (though not imexamine). The data from the different amplifiers are not flipped to the same orientation before writing to disk, but the header keywords allow ds9 to display the files correctly. We hope that all the file keywords are correct, and that programs like IRAF's mscred will work, but we can't guarantee this at this time. The SAO version of NOAO's mscdb package must be installed to use mscred. As already written, the data files are stored in directories of the format /SPEC/ year.monthday (or CHELLE/ year.monthday . The files are also archived both on the local computer as well as back in Cambridge (more slowly). The fiber mapping files ("filename_map") are stored along with the data files. This information is also stored in the FITS file. Each new file is automatically displayed into the active frame of ds9 (named spec9 here to avoid conflicts with other ds9 programs that may be running). To load files off the disk, select FILE:OPEN OTHER: OPEN MOSAIC IRAF, and then find your directory and filename. You may load files into different frames via creating a new frame: FRAME:NEW. Run through frames via Tab. Do not use mscdisplay in IRAF. The contrast can be changed with the right mouse button. For further contrast levels, select Scale:Scale Parameters from the top bar menu. You'll get a histogram of the data - high and low values may be selected by moving the red and green vertical lines with the mouse. Imexamine works as is with these files; there is no need to use mscexamine. Make sure you start up IRAFin a xgterm window. The data obtained by CfA PIs will be reduced by the Telescope Data Center (TDC) unless the spectrograph operation mode is inconsistent with the standard pipeline or unless the PI wishes to reduce his or her data. This document describes the procedure and file structure of the reduced data, called HSRED. The MMT maintains an exportable version of the data reduction pipeline . Nelson Caldwell is very familiar with the operation and characteristics of the spectrograph, and has a good deal of experience with data reduction. He is willing to provide a limited amount of help to users; he may be contacted at caldwell at cfa.harvard.edu. All Hectospec or Hectochelle data will be archived nightly by the TDC. After each object exposure, a quick look reduction process is run automatically and the results are displayed in an iraf window. 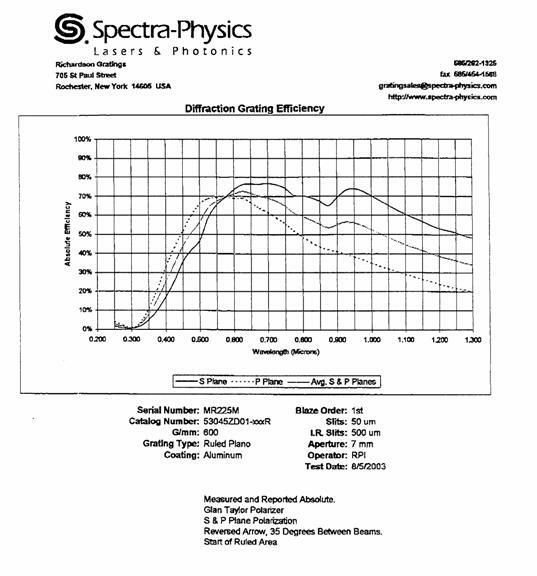 These spectra have been wavelength calibrated and sky subtracted. To flip through the spectra, use the open or close parentheses keys, "(" or ")". "q" will exit the window. (For CHELLE no sky subtraction is done).. The program currently runs on lewis. 1. Open an xgterm with xgterm &. You may resize the font via shift-middle mouse button. Start up IRAF with cl. 2. You'll need to know the names of the files you want to combine. The IRAF command ldata will list the files in the current data directory, or you can look at the data logs. The output files will be written in the current directory. 3. 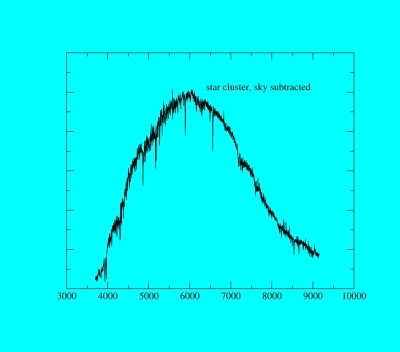 For multiple files, the program detects the cosmic rays by comparing images, and interpolates across them in individual frames, The frames are then averaged together before extraction begins. For a single exposure, the cosmic rays will not be deleted. which would extract and combine files file1 and file2 from the 2006.1010 directory. 5. The program takes 1-3 minutes. The files used in the process are then listed, along with the names of the output files. If the output file existed already, the program will prompt for deletion. 6. 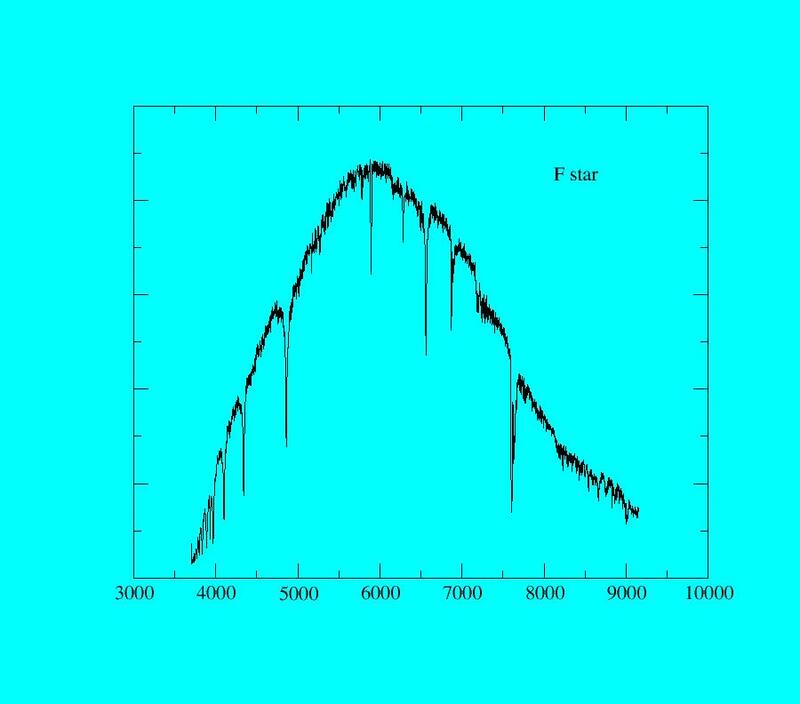 To look at the spectra, use splot (you may need to load imred and then specred first, though they are supposed to be loaded automatically). To run through the spectra one by one, use the ( and ) keys. The X and Y scales have been fixed to display low signal spectra well; to scale to the entire range of the spectum, type w and then a while viewing a spectrum. To smooth, type s.
7. At the beginning of each Hectospec run, and certainly if the fiber shoe has been moved from Chelle to Spec, a crude wavelength and aperture location adjustment must be made. Inspect the extracted spectra which have not been skysubtracted from any of your images. Using splot, first determine whether the aperture locations are correct. If the sky lines shift between alternate spectra, then the aperture locations are not right. In Spice, select the configure tab, and locate the quick look ApDome window. There are four possible choices here, 1-4. Change the choice (and press save), and re-run qspec on an exposure. 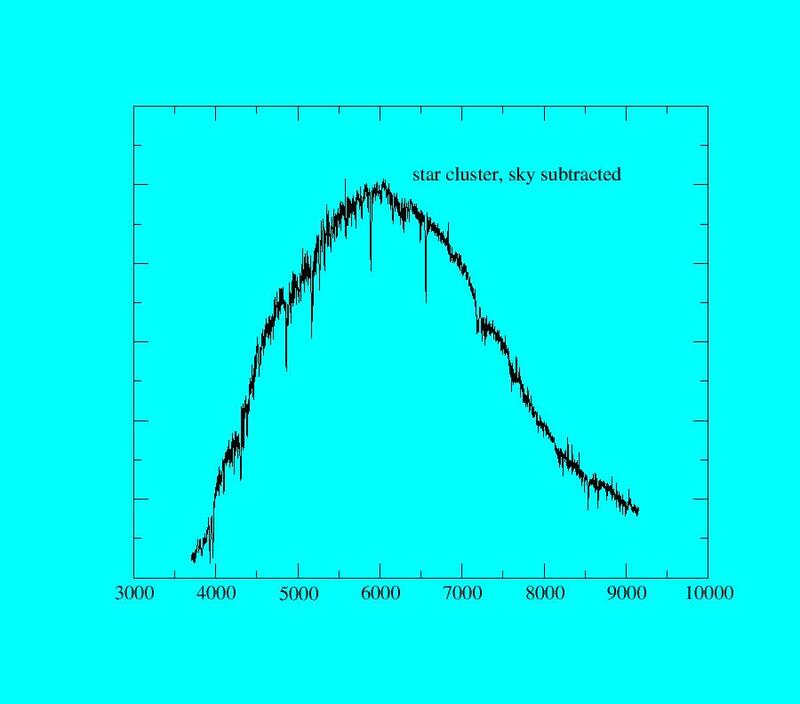 Once you have a working ApDome selection (by trial-and-error), now determine the wavelength of the brightest night sky line, whose wavelength is supposed to be 5577A (but which may be off a little because of the problem we are about to fix). Subtract the measured wavelength from 5577 (i.e., 5577-wave_observed). In Spice, now locate the quick look wavelength offset window. Note the wavelength offset in this window, and add the offset you just determined to the existing value. Click on save. Now rerun the extraction. The skysubtraction should work properly now. Trouble may ensue if there are no sky fibers in apertures 1-150 or 151-300. A ds9 regions file can be brought up to identify all the apertures and which fibers they correspond to. Click on regions, and load regions, and select the file /h/spec/specaps.reg. We currently have available a 270 groove/mm grating blazed at 5200Å, and a 600 gpm grating blazed at 6000Å, both purchased from David Richardson Grating Laboratory. 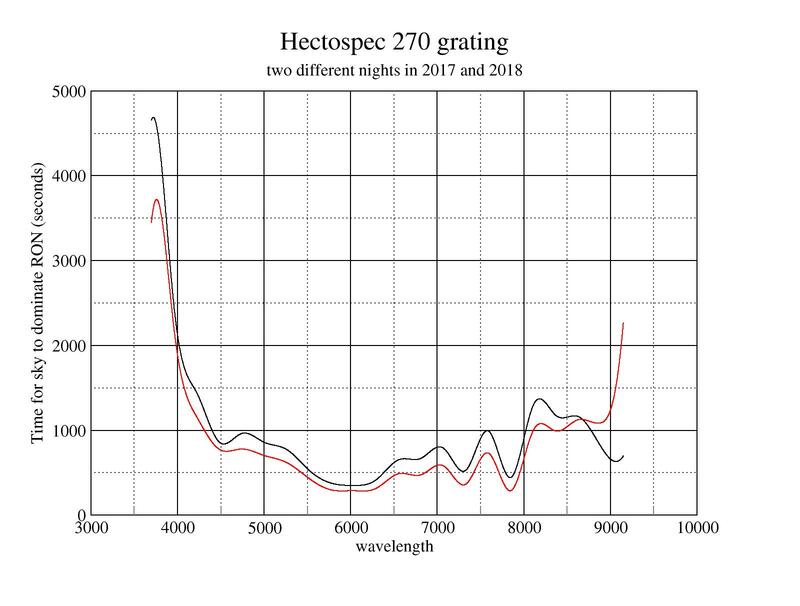 The spectral coverage, spectral resolution, anamorphic magnification, grating angles and RMS image diameters for these gratings, both set up with Ha as the central wavelength, are shown below. The spectral coverages in this table refer to the whole 4608 pixel format, but there is vignetting and resolution losses begin occur at pixel numbers less than 600 and greater than 4000. Remember that second order contamination may be an issue for some applications. Currently, we do not have order blocking filters. 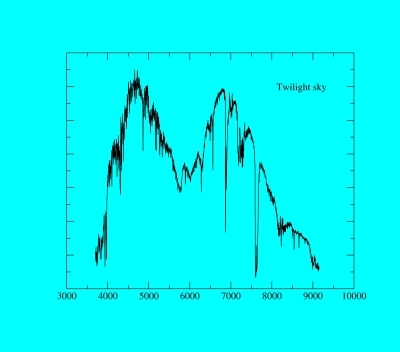 The spectral resolutions quoted are as measured with arc lines or night sky lines, with the first number referring to bluer wavelengths, while the second if present refers to redder lines. For the 270 grating (which gives a dispersion of 1.2 Å/pixel), there is only one setting. 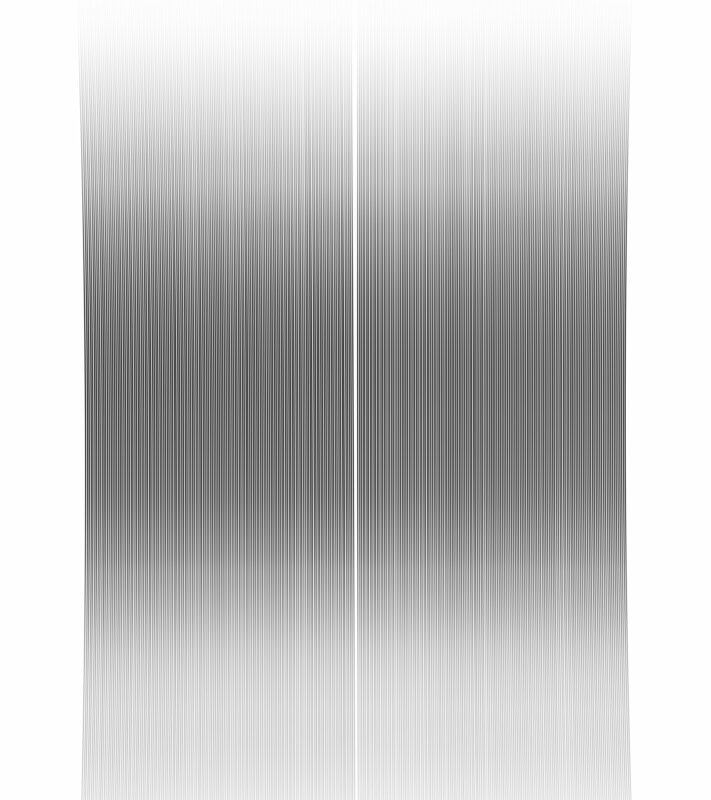 For the 600 (0.55 Å/pixel), the choices for central wavelength are fixed at intervals of 500Å, starting at 4800Å. Figure 16. The efficiency of the 600 line grating. The Hectospec optical layout is simple enough that very high throughput can be achieved if good reflective coatings are used on the mirrors (2 surfaces) and good antireflection coatings are used on the lenses (6 fused silica surfaces). We have used the same dielectrically-enhanced silver reflective coatings and Sol-gel antireflection coatings that we used in the efficient FAST spectrograph. Our predictions for Hectospec's overall throughput with the 270 line grating are shown below. The column labeled "Add. Fiber Losses" includes FRD, end reflection losses, and the losses from misalignments of the fiber axis with respect to the chief ray at the f/5 focal surface. This table does not include aperture losses at the fiber input, which will depend on the seeing and the quality of the astrometry of the targets and the guide stars. We can compare the throughput predictions with measurements of a spectrophotometric flux standard star BD+284211 in 1″ seeing. BD+284211 was stepped across a fiber entrance aperture to find the position where we detected the maximum flux. For an apples to apples comparison we need to correct the measurement for the aperture loss. Figure 17. 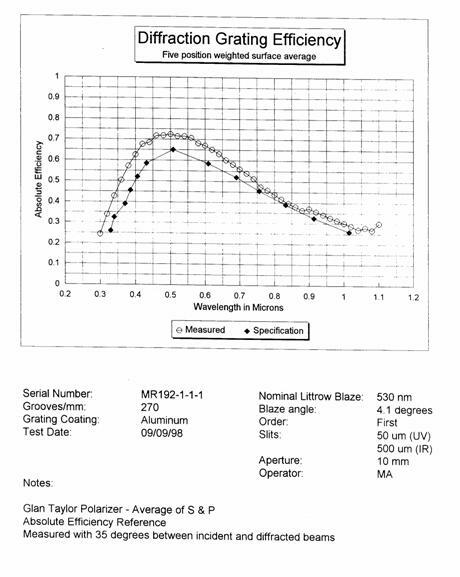 Measured throughput in 1″ seeing not corrected for aperture losses. The appropriate aperture correction for the plots above (measured with Megacam images) is about 1.7 (ratio of flux within a 20″ diameter aperture to the flux within a 1.5″ diameter aperture). Therefore, the peak throughput for light that hits the fiber aperture is about 17% (to be compared with the prediction of 23%) . If we average over wavelength, the measured throughput is about 75% to 80% of the predicted numbers. We present several performance plots based on actual Hectospec data. Except where noted, these plots refer to the 270 gpm grating. Figure 18. The signal-to-noise ratio per pixel for a 45 minute exposure as a function of aperture magnitude (1 arcsec2 diameter aperture.) The SNR per pixel is ~26 at R=21. 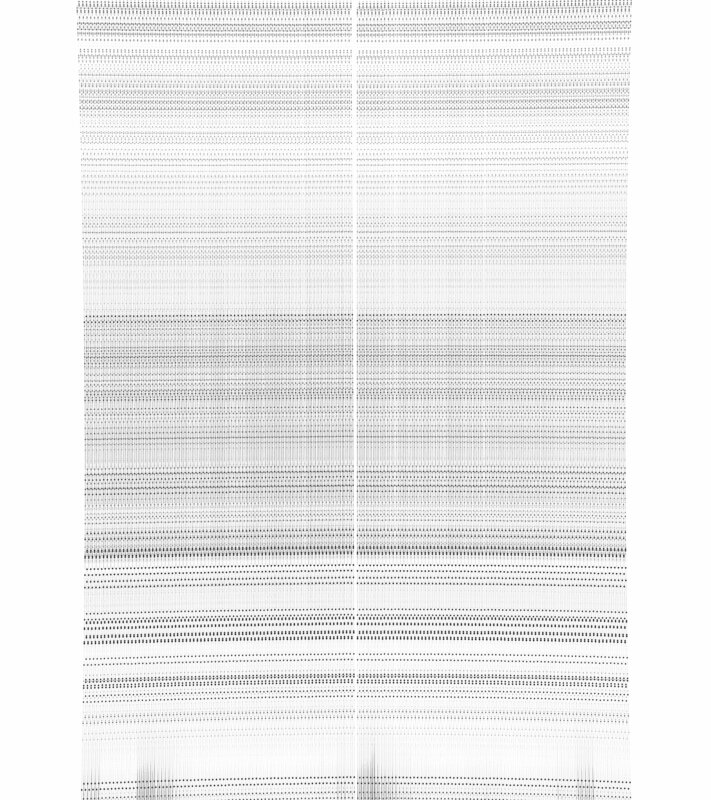 The relations for 4500Å and 8500Å have the similar slopes, but show a SNR per pixel of ~9 at an aperture magnitude of R=21 for the same exposure length. Improvements in sky subtraction techniques may allow improvement at 8500Å . Analysis and plot courtesy of Daniel Eisenstein. Figure 19. 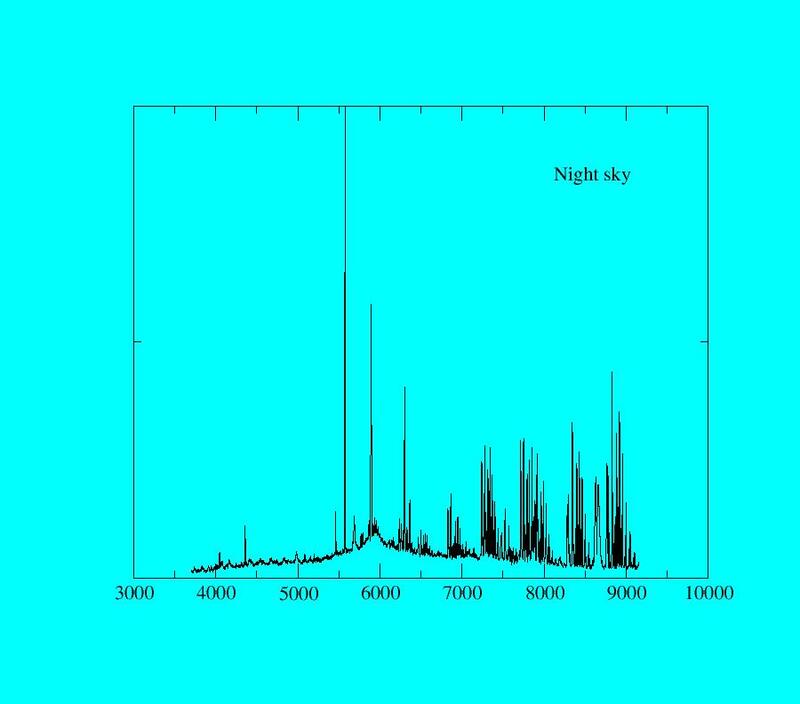 The absorption line cross-correlation signal-to-noise ratio ~(1+R) for 45 minutes of exposure as function of R aperture magnitude (2.6 arcsec2 diameter aperture). 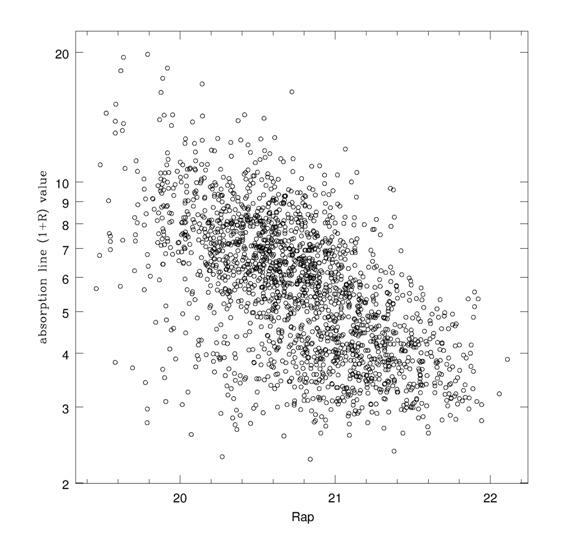 All of the 1974 galaxies in this plot had reliable redshifts. 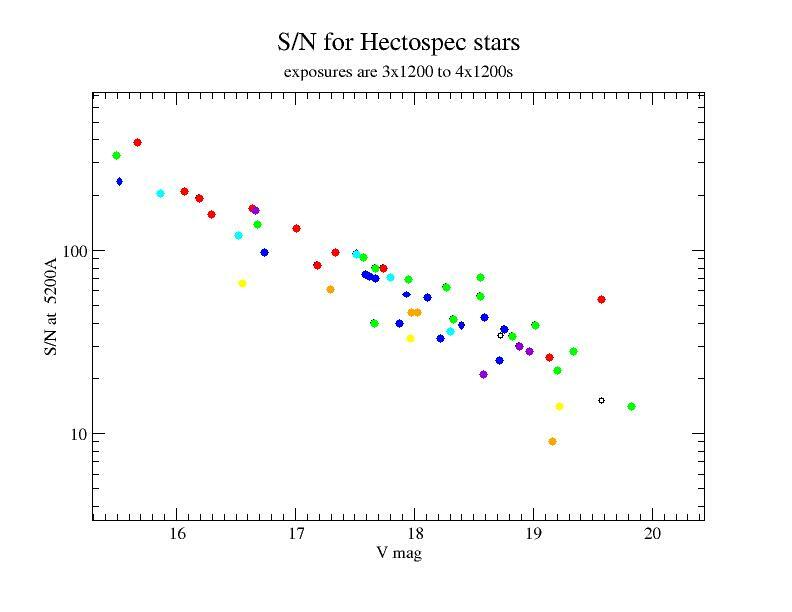 The SNR ratio shown here is reduced somewhat by the use of templates from the FAST spectrograph. Better cross-correlation templates will be created. Courtesy of Michael Kurtz. Same for a 90 min exposure of faint, red galaxies. Redshift distribution of previous data set. Another data set of faint galaxies. And another. Note the wide variation in depth. Next we move on to other kinds of objects. aren't separated in the diagram, because of variable observing conditions. represent the magnitudes through the apertures. Fig 22. Cross - correlation coefficients derived from a globular cluster project, using the 600 gpm grating. 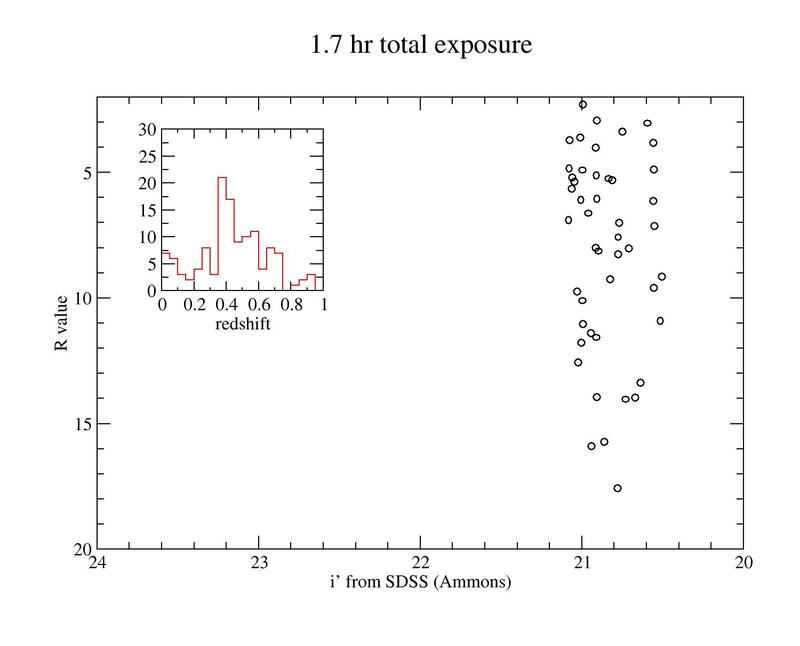 Red dots show spectra too noisy to be useful, but generally, the spectra with coefficients less than 5 are bad as well. 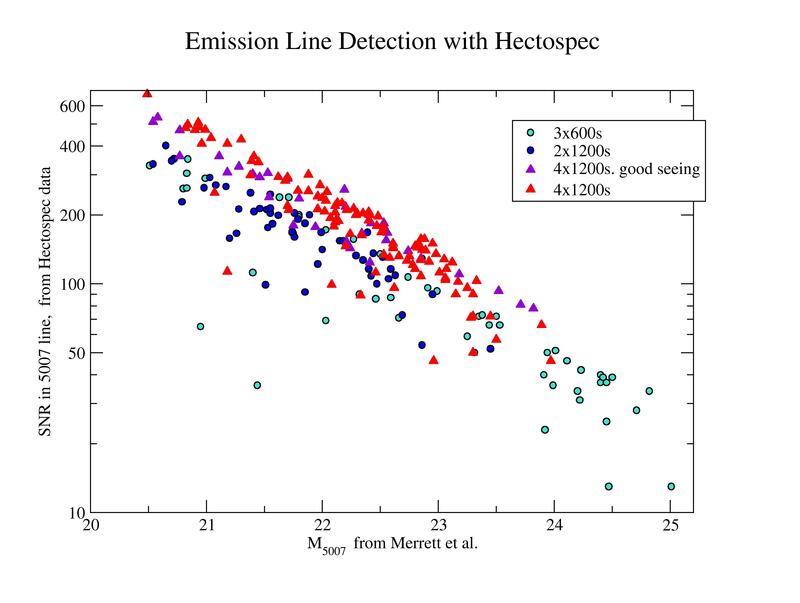 Thus for this particular set of observations, the limiting magnitude was about 21.5, except for emission line objects. Figure 23. 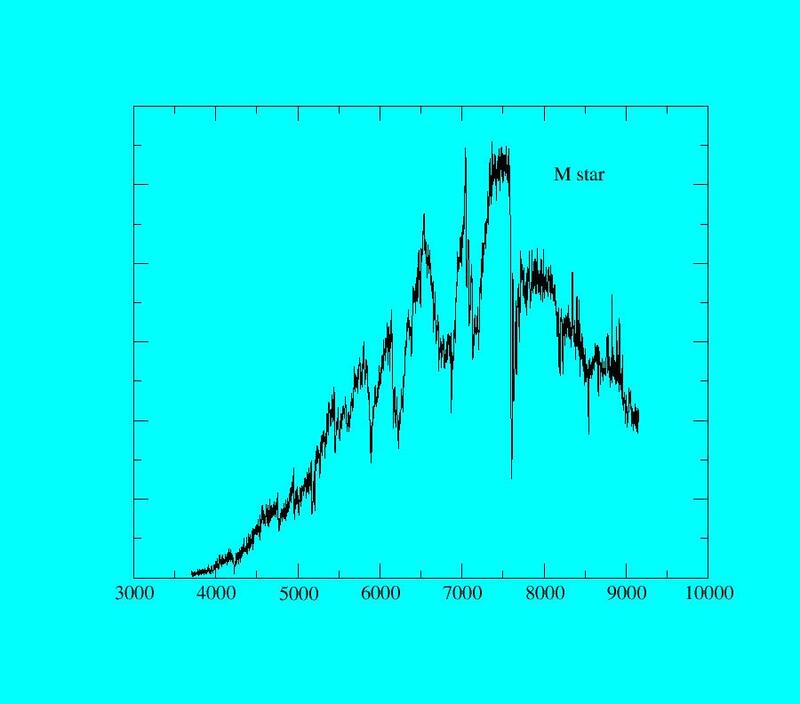 Signal to noise ratio for the [OIII]5007 line in a sample of M31 PNe. 4 different fields are shown here, each with different conditions or exposure times. The noise was calculated from the variance spectra produced in the reduction. The signal is the total counts in the line. 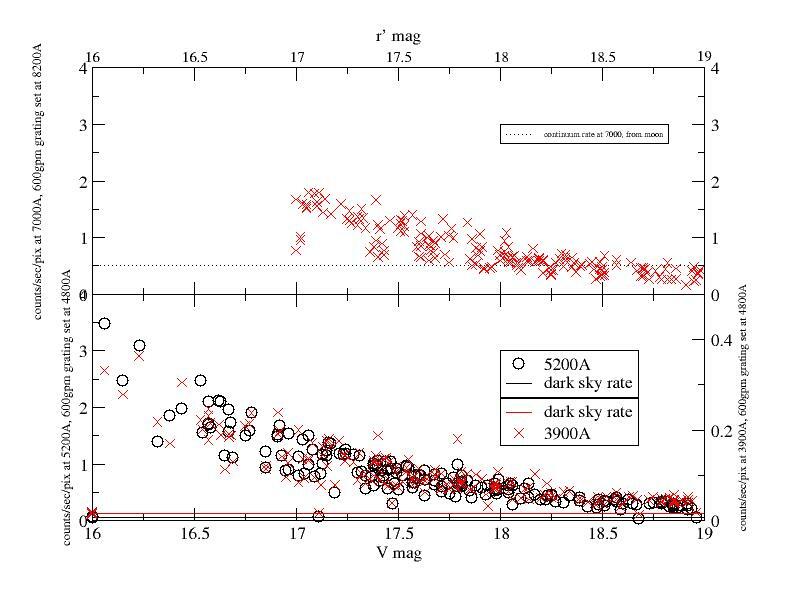 Magnitudes are from Merrett et al, and are on the Jacoby system. 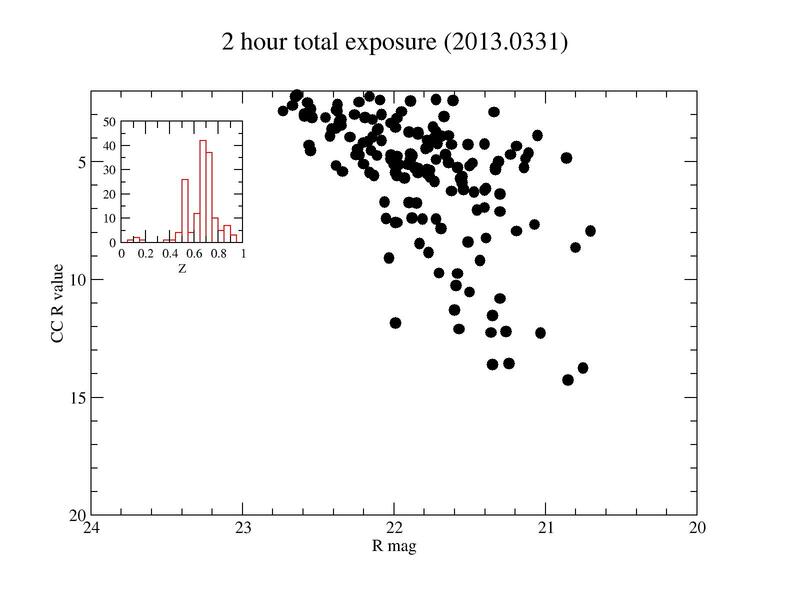 For instance, at a magnitude of 22, a S/N of over 200 can be obtained with 4x1200s exposures. Figure 24. Count rates for the 600gpm grating, at two central wavelength settings, a fairly blue one of 4800A (bottom), and one at 8200A (top). 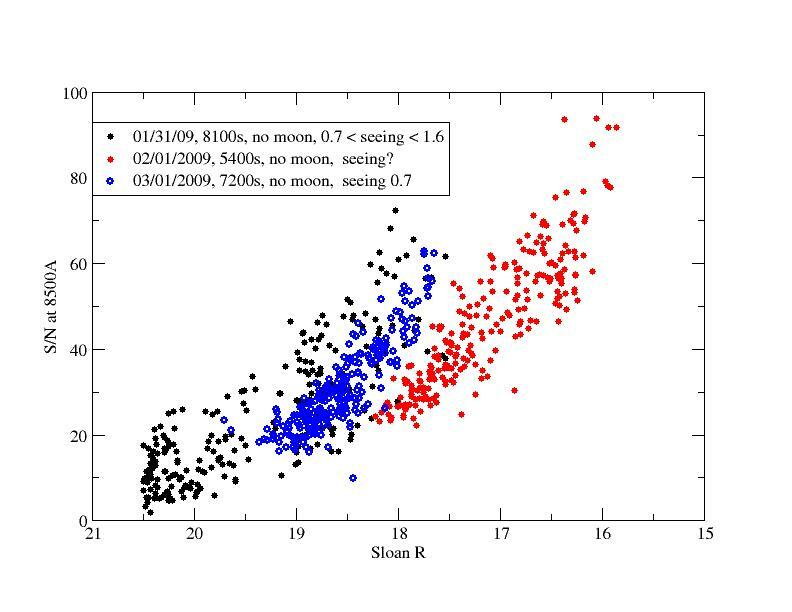 Plotted are counts/sec/pix for stars, as a function of V mags (bottom) and r' mags (top). Fig 25. S/N ratios at 8500A for stars, using the 600gpm grating set at 7800A. Three different nights are shown, which don't match up probably because of different seeing & transparency for those nights. Fig 26. 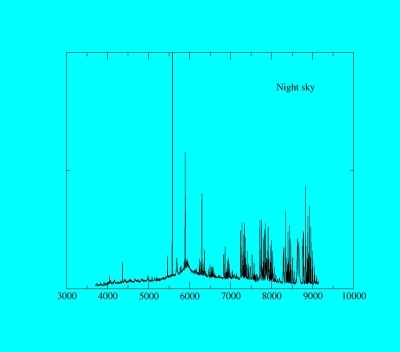 Exposure time for sky level to exceed the readout noise for the 270 gpm grating, as a function of wavelength. For instance, at 5000A, an exposure of 800s is needed for the sky noise to dominate the readout noise. This web site contains an ETC for Hectospec. This list is meant for the attending astronomers. If the equipment is all ready, or if the run is underway, skip to item 8.
then Start Rack (wait 2 minutes). Now go to the Configure tab, enter the observers' names, select the correct telname (mmt_f5_adc), the correct instrument ("hectospec" or "hectochelle"), and the correct detector ("specs"). Insure the binning and grating are correct. At the start of the run, if a grating has been changed, or if a new order has been selected, press ConfigBench, and wait about 10 seconds. Insure that the CCD temperatures are within 0.1 degree of -120 (for spec, the right temperature readout is broken). If not call an expert. Go to the StandardOps tab. Select bias for the exposure type, and take ~10 frames. Inspect these on ds9, and insure there is no pattern noise. The first image or two may be saturated - ignore these. :l 4000 4200, that's letter l, not number 1). The pixels beyond 1075 are overscan. The dark level should not be more than about 0.6 counts above the overscan in 300seconds. If it is, call an expert. Have the robot operator configure the fibers to the calibration setup. Have the telescope operator open the mirror covers. In the StandardOps tab, select domeflats. Turn on the continuum lamps, and take 10 exposures of 2 seconds for the 270gpm grating, or 10s for the 600gpm grating, at each setting planned for the night. Now turn off the continuum lamps, and select comps. For the 270gpm grating, turn on the HeNeAr lamps and take 5 300s exposures. Turn off the lamps when finished. For the 600gpm grating at a blue setting (6300 or bluer), also use the HeNeAr lamps with exptimes of 480s. For redder settings, use the Penray Lamps, exptime=3s. Take a set for each planned central wavelength setting for the night. If you are able to open the telescope at sunset, start taking skyflats as soon as possible, beginning with 2 s exposures. The robot operator will move the telescope in between exposures. 5 of these are sufficient - do not take so many that you are delayed in acquiring the first field. If you are changing gratings in the middle of the night, make sure to take calibrations for that in the morning. Otherwise, no more calibrations are required. Bring up the schedule, by typing cd ; schedule spec 2008c , for instance, but use the current trimester name ("a"=Jan-Apr, "b"=May-Jul; "c"=Sep-Dec". Select the current calendar day (not UT day) tab, and click on print. Review the program information from the proposals (these are kept in /home/spec/*.pdf , use acroread to view). After the robot operator configures for a new field, SPICE will know about the exposure info and title. So most of the time you simply have to click "GO" to take the exposure. If the grating has been changed or its tilt has been changed, you'll need to "ConfigBench" in the Config tab before exposing (a warning will remind you of this). During the night, monitor the time and try to keep to the schedule. Enter comments in to the logs about the conditions (seeing and clouds) and problems. qspec is run automatically on the data; check these spectra to insure good data quality. 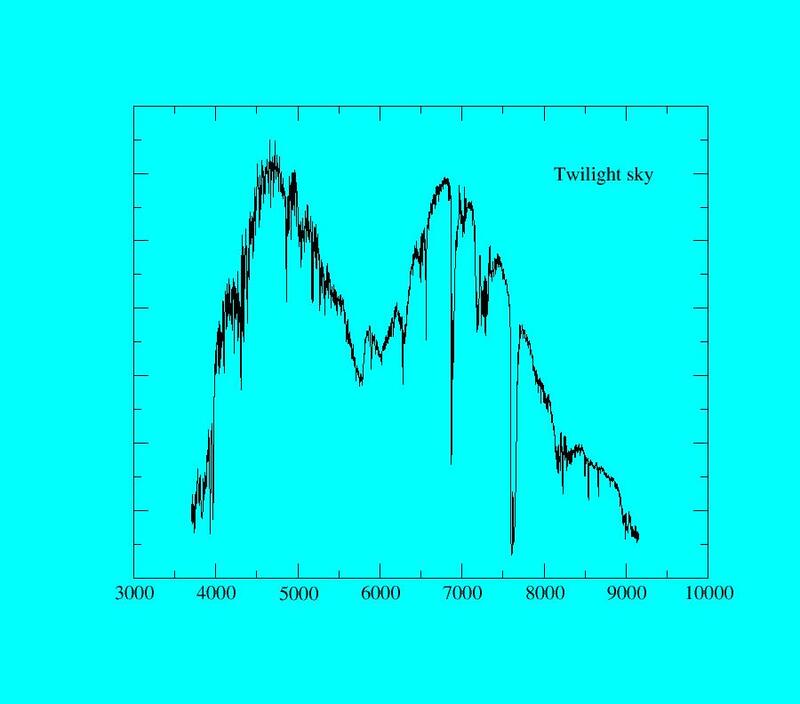 In particular, make sure there are indeed objects in the spectra, because occasionally there aren't any, due to astrometry errors. If there is such a problem, abort the field and move on to the next scheduled field. 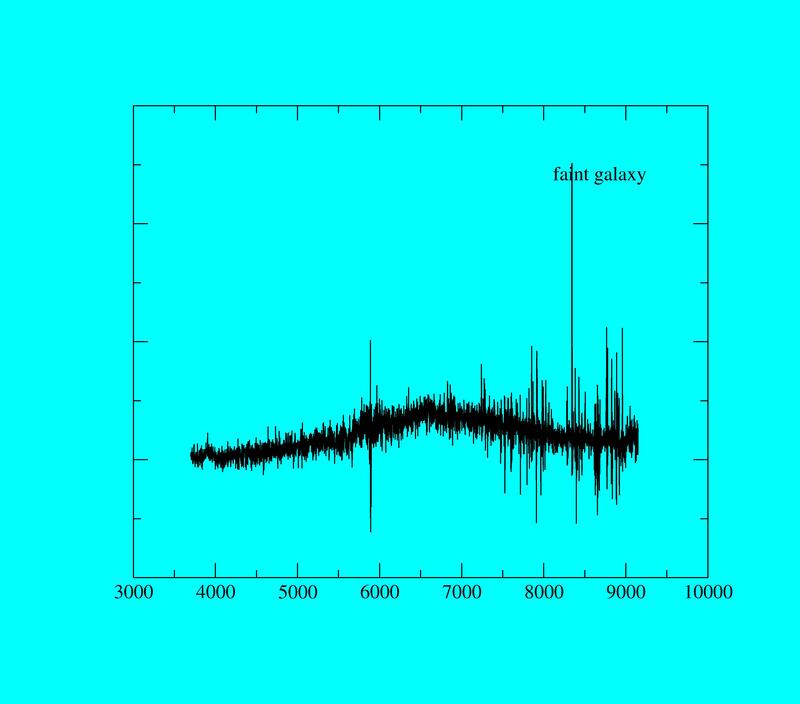 a spectrum of a faint galaxy, with cross-correlation coefficient about 5. Some of these files have been compressed with bzip2; use bunzip2 to decompress. comparison image,spectra run vertically, blue at top.